This myth was started by a paper in 1998 entitled “Fishing down marine food web” authored by Daniel Pauly and several others. 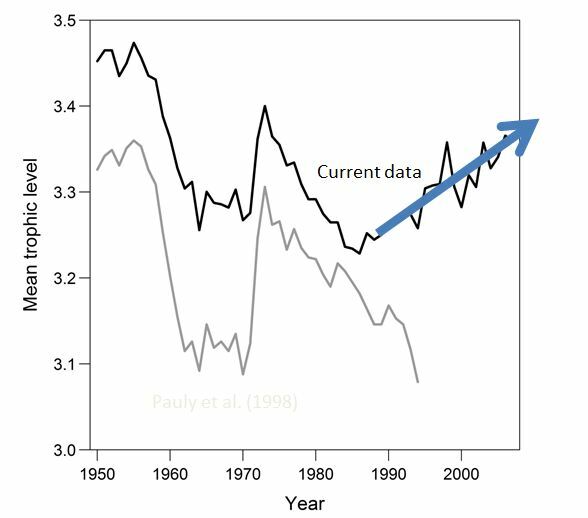 The observation was that the mean trophic level of the worlds fish catch was declining as seen in the graph taken from Pauly’s paper. The authors then have gone on to argue that there is a common trend in fisheries, starting to fish at the top of the food chain, once those stocks are depleted, fishing fleets move down the food chain, and the net result is that soon nothing will be left in the ocean but jelly fish. The original paper, published in Science is one of the most commonly cited papers in fisheries and although this myth has been thoroughly debunked it continues to be widely believed, and Pauly and co-authors have an entire web site devoted to defending the idea. Three papers have shown the errors in both the analysis and also the implications as asserted by the authors. The first paper was published by Tim Essington and co-authors in 2006. Their paper showed that the decline of mean trophic level in most marine ecosystems was not that all the high-trophic level fish were gone, but that in fact catch of high trophic level fish continued to rise. 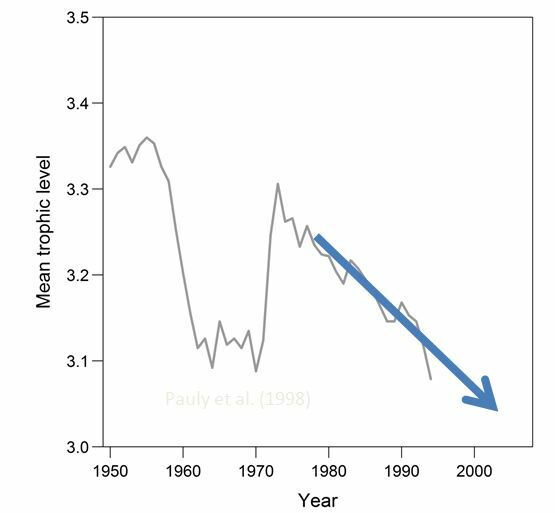 The decline was due to increased yields of lower trophic level fish. So while this paper didn’t challenge the assertion that mean trophic level in the catch was declining, it showed that the assertion that the high trophic level fish were declining in catch was wrong. In 2010 Trevor Branch and colleagues published a paper in Nature showing that in fact, the mean trophic level in the world’s catch was rising, not falling, and that the decline Pauly had shown was due primarily to two species, the rebuilding of the Peruvian anchovetta stock (low trophic level), and the decline of catches of Atlantic cod. 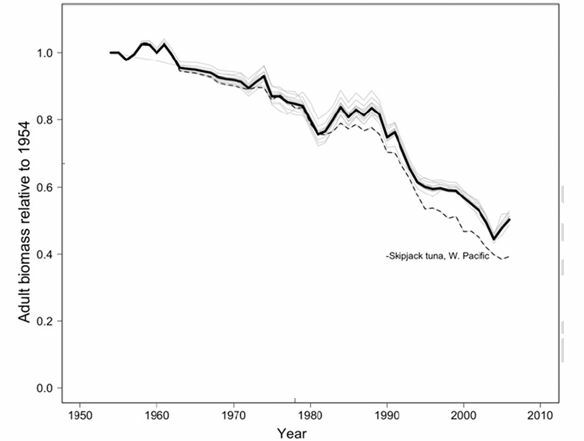 Worldwide the mean trophic level of the catch was rising, not falling. Branch also showed that if you look at the mean trophic level of fish in marine ecosystems, there was no overall decline in mean trophic levels. Branch pointed out that looking at any characteristic of catch, where it is total catch, or trophic level, is not necessarily a good measure of changes in the ecosystem itself since catches are rarely a random sample. The final paper that nailed the coffin on “fishing down marine food webs” was also published in 2010 in Proceedings of the National Academy of Sciences, by Suresh Sethi, Trevor Branch and several others. Sethi began by asking a basic question — one that should have been asked by the proponents of fishing down a decade earlier. Are high trophic level species more valuable than low trophic level species? Remember the argument in support of fishing down is that fishing fleets begin with high trophic level species because they are more valuable. What Sethi and co-authors found was that there is no relationship between trophic level and the price or value of fish. Some of the most expensive fish in a marketplace are prawns, crabs, scallops and lobsters, all relatively low trophic level species. Even among higher trophic level fishes there is no correlation between trophic level and value. The mechanism that underlies the theory of fishing down food webs simply isn’t true. Sethi found that fisheries do not begin with high trophic level species, but instead the development of fisheries in different regions of the world is largely independent of trophic level. Fishing down food web — a Busted Myth. Pauly, D., V. Christensen, J. Dlasgaard, R. Froese, and F. Torres Jr. 1998. Fishing down marine food webs. Science 279:860-863. Essington, T. E., A. H. Beaudreau, and J. Wiedenmann. 2006. Fishing through marine food webs. Proceedings of the National Academy of Sciences of the United States of America 103:3171-3175. Branch, T. A., R. Watson, E. A. Fulton, S. Jennings, C. R. McGilliard, G. T. Pablico, D. Ricard, and S. R. Tracey. 2010. The trophic fingerprint of marine fisheries. Nature 468:431-435. Sethi, S. A., T. A. Branch, and R. Watson. 2010. Global fishery development patterns are driven by profit but not trophic level. Proceedings of the National Academy of Sciences of the United States of America 107:12163-12167. This myth began with a 2003 paper in Nature entitled “Rapid worldwide depletion of predatory fish communities” in which the authors, Ransom Myers and Boris Worm, used a large body of Japanese tuna fleet longline records to show that the catch per hook declined very rapidly when the fishery began across a range of species, and that by 1980 catch per hook around the world was roughly only 10% of what it had been in the 1950s when the fishery began. This was taken as evidence of depletion of the oceans of tunas and relatives, and is the basis for repeated statements that 90% of the fish of the ocean are gone. To some extent the last word on this issue was a paper published in 2010 in PNAS by Juan-Jorda and colleagues. They showed that globally tuna stocks by 2010 were at 40-50% of their unfished abundance, still generally at or above target levels, and that in 1980, when Myers and Worm had argued tuna had declined by 90%, in fact tuna stocks had been depleted only slightly and were at 80% of their unfished abundance. The myth that fish stocks have been depleted to only 10 or 20% of the original abundance based on the tuna and bilfish of the high seas is another BUSTED MYTH. Myers, R. A. and B. Worm. 2003. Rapid worldwide depletion of predatory fish communities. Nature 423:280-283. Walters, C. J. 2003. Folly and fantasy in the analysis of spatial catch rate data. Canadian Journal of Fisheries and Aquatic Sciences 60:1433-1436. Sibert, J., J. Hampton, P. Kleiber, and M. Maunder. 2006. Biomass, Size, and Trophic Status of Top Predators in the Pacific Ocean. Science 314:1773-1776. Juan-Jorda, M. S., I. Mosqueira, A. B. Cooper, J. Freire, and N. K. Dulvy. 2011. Global population trajectories of tunas and their relatives. Proceedings of the National Academy of Sciences of the United States of America 108:20650-20655.